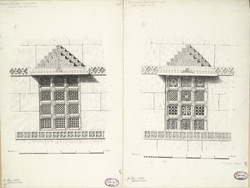 Illustration of windows from the Queen's mosque at Sarangpur near Ahmadabad in Gujarat. The Queen's mosque, also known as the Malik Sarang mosque or Rani Mosque was built c.1530 by Malik Quivam ul Mulk, the governor of Ahmadabad in the 1520s and a nobleman at the court of Sultan Muzaffar Shah (r.1511-26). The mosque has five large domes and a series of arched entrances along the facade. The larger central entrance is flanked by two robust minarets, now truncated at roof level. The bases of the minarets are covered in elaborate carving in the niches and across a series of horizontal bands. The windows at the Queen's mosque are also highly decorative. Along the front wall there are four perforated windows, each divided into twelve squares filled with a variety of patterns symmetrically arranged. Along the back wall, there are six more windows of similar design. This illustration shows the windows from the north corner.